A new biomedical engineering and chemical engineering facility is planned to open in 2019. The new building project is intended to enhance engineering collaboration at the University and position both departments for significant growth. UNIVERSITY PARK, Pa. —Plans are underway for the construction of a new facility at Penn State that will house the departments of biomedical engineering and chemical engineering. The new facility, planned to open in 2019, is intended to enhance engineering collaboration at the University and position both departments for significant growth. With support from the Penn State Board of Trustees, the new building project, estimated at $150M, is currently the largest project in the University’s capital budget. Plans for the new facility include a six-story, 194,500-sq.-ft. building plan that will house state-of-the-art classroom spaces, lecture halls, student common areas and office spaces as well as laboratory suites to support research clusters and a sharing of resources. The Department of Biomedical Engineering, which is the fastest growing sub-discipline in engineering at Penn State, is quickly outgrowing the Hallowell Building in which it currently resides. By 2019, the department seeks to double its current faculty count and increase annual acceptance of undergraduate students from 40 to 100 students. Plans for the new facility will take the place of Fenske Laboratory (the current home of the Department of Chemical Engineering) located near the intersection of Shortlidge and Curtin roads on the University Park campus and will provide room for future growth. Biomedical engineering and chemical engineering, two disciplines that complement one another, will produce academic and research synergies as a result through their co-location. 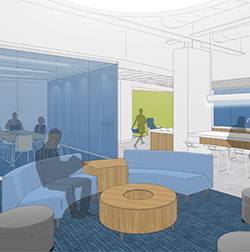 Additional features of the building are set to include a student knowledge commons space that will facilitate group and collaborative work and design attributes that will support the “engineering on display” concept. 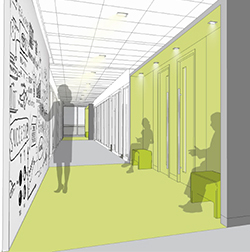 Many of the teaching and research laboratories will be situated along a main corridor with transparent glass walls to create a modern, open feel and allow visitors and prospective students to observe the interesting research and discovery taking place within the labs. Ground breaking for the project will commence this semester and is set to be completed in a single phase with all occupants of the Fenske Laboratory moved to other locations during construction. Renderings of the new biomedical engineering and chemical engineering building are available at http://bit.ly/2bteIMM. To learn more about supporting the facility, including naming opportunities and gift options, please visit http://chemebiomedbuilding.engr.psu.edu/donate/.